The two speak informally on the sidelines of the Asia-Pacific Economic Cooperation summit in Vietnam. “He said he absolutely did not meddle in our election. He did not do what they are saying he did,” Trump said of Putin, speaking with reporters aboard Air Force One as he traveled to Hanoi, the second-last stop of his Asia trip. “Every time he sees me, he said: ‘I didn’t do that.’ And I believe, I really believe that when he tells me that he means it,” Trump said, noting that Putin is “very insulted” by the accusation. Trump called the accusation an “artificial barrier” erected by Democrats – once again casting doubt on the U.S. intelligence community’s conclusion that Russia did try to interfere in the election to help Trump win. Trump and Putin did not have a formal meeting while they were in Vietnam for the Asia-Pacific Economic Cooperation summit, but the two spoke informally several times on the event’s sidelines and reached an agreement on a number of principles for the future of war-torn Syria. But Trump made clear that the issue of Russian meddling in the election hovers over the leaders’ relationship and said it jeopardized their ability to work together on issues including North Korea’s escalating nuclear program and the deadly conflict in Syria. Trump danced around the question of whether he believed Trump’s denials, telling reporters that pressing the issue would have accomplished little. “He said he didn’t meddle. I asked him again. You can only ask so many times,” said Trump. Trump’s suggestion that he may believe Putin over his own nation’s intelligence community is certain to re-ignite the firestorm over the issue of election meddling. Meanwhile, a special counsel investigation of potential collusion between Moscow and Trump campaign aides so far has resulted in two indictments for financial and other crimes unrelated to the campaign, as well as a guilty plea. Congressional committees have also been interviewing campaign and White House staff. 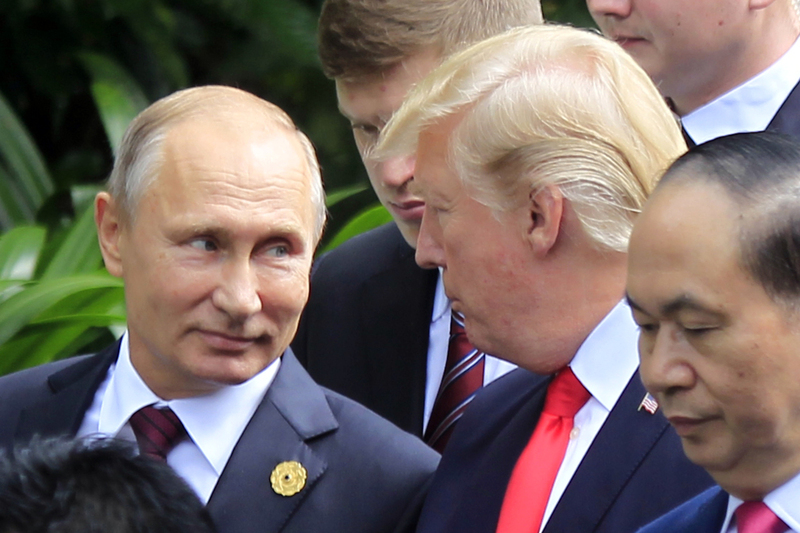 Snippets of video of from the summit in the sea-side city of Danang showed Trump and Putin shaking hands and chatting, including during the world leaders’ traditional group photo. The two walked together down a path to the photo site, conversing amiably, with Trump punctuating his thoughts with hand gestures and Putin smiling. Journalists traveling with Trump were not granted access to any of the APEC events he participated in the picturesque tropical seaside city Saturday. White House officials had worked quietly behind the scenes negotiating with the Kremlin on the prospect of a formal meeting. The Russians raised expectations for such a session and Trump told reporters aboard Air Force One en route to Asia that it was “expected we’ll meet with Putin” to discuss issues including ramping up pressure on North Korea to halt its nuclear and ballistic weapons program. As speculation built, the two sides tried to craft the framework of a deal on the future of Syria that Trump and Putin could announce in a formal bilateral meeting, according to two administration officials not authorized to speak publicly about private discussions. Trump will be attending a state dinner in Hanoi Saturday night. On Sunday, he’ll meet with the country’s president and prime minister before heading to his last stop: The Philippines.